Throughout the year, Suburban Ford Auto Group in Sandy receives recognition for its staff's community involvement. This past week, it was once again recognized for its customer service and overall success in sales with the company's President's Award. This is the 13th time the dealership has received this accolade in its 34 years in operation. This makes it the second "winningest" dealership in the Seattle region, which includes most of the Pacific Northwest. Only 10 percent of dealers get this award. Out of the 120 dealerships in the region, only nine received one this time around, including Sandy Suburban Ford. "This is a huge award and it is attributed to our employees," said Suburban Ford's General Manager Erinn Sowle. "I'm so proud of this. ... We have a great staff that knows our culture is very customer-centric." 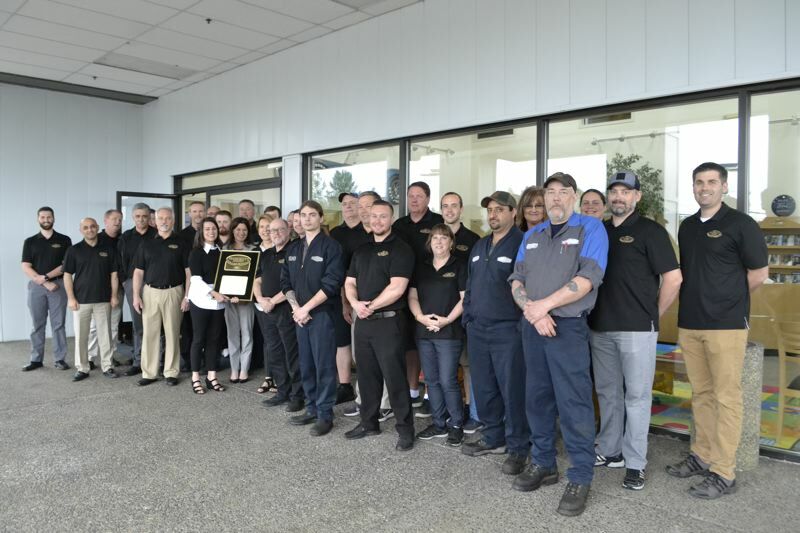 "If all dealers did as well as you, our jobs would be much easier," Regional Manager Erika Weagly added as she handed Sowle a commemorative plaque. To earn the President's Award, a dealership must meet their sales objectives besides providing excellent customer service. Sandy has a 200 percent sales expectancy, Sowle noted. "I think the fact that we're steeped in our community and invested in our community has greatly contributed to our success," Sowle added. Suburban Ford is an annual sponsor of the Sandy Mountain Festival, provides scholarships for local students, donates funds to the Mt. Hood Community College's Ford ASSET program and food to the Sandy Community Action Center. It also is a regular donor to Guide Dogs for the Blind, to which it contributes a percentage of every sale this year.